How to add shadow effects to shapes. How to write text on the canvas. Canvas is now more or less supported by all major browsers. Internet Explorer added support for it in IE9. There are some methods, or more precisely arguments to methods which aren't supported by them all, but we won't use any of them in this tutorial. In this tutorial, we are going to draw an image on the canvas. It's this clock face image from http://agf81.deviantart.com/art/Clock-Face-2-169291889. So before we begin, please right click on the image below and save it so that you can access is it from your code later on (example: inside the sub folder "images"). It contains a canvas element and a Script tag. Notice that the canvas element contains a width and height attribute. This is important. Usually, we will set width and height of elements by specifying CSS attributes, example: <canvas style="width:400px;height:400px">. But this will not work so well for canvas since it will just scale it and not change it's internal width and height. This is actually good news, because it means that we can scale canvas elements by changing it's CSS width and height attributes. Try for example to click the link below to resize the clock above to 300x300 pixels. We have also added a SCRIPT tag. 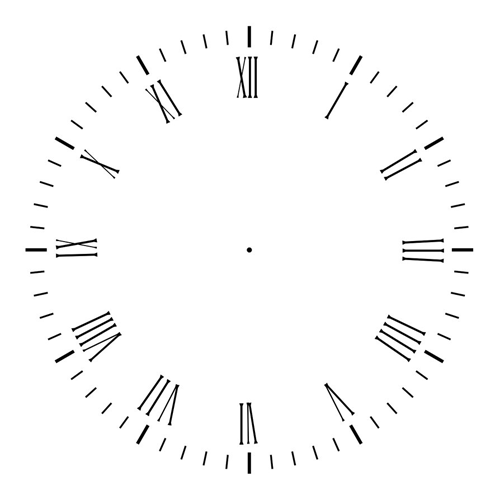 All our code for the clock will go between the <script> and </script> tag. We have a reference to the canvas DOM element(<CANVAS>) and a reference to the context. So what do we need to do in order to create the clock above? Write our own brand name "Canvas" to the watch. And finally have a clockApp function which executes only once when we start the app. Before we do more coding on the clock, let's cover some basic material. We draw on the canvas by using methods on the context object. Examples: moveTo(), lineTo(), rect(), arc() etc. Context properties such as strokeStyle (example color of lines), fillStyle (example: fill color of a rectangle), canvas rotation etc are part of what is called the context state. We can use context.save() to save the current state of the context, and context.restore() to restore back to a previous state. // strokeStyle is now "red" and not "blue" since we restored the context. First the stroke color was set to red. Then we saved the context state. The call to context.restore() gave us back the old context before last call to context.save(). That means that strokeColor is now "red" again and not "blue". Finally we created a line from our last position(200,100) to 200,200 with the current stroke color, which is red. In our code for the clock we're going to rotate the canvas in order to get the right angle for our hour-, minute-, and second hands. We're going to draw the handles from the centre of the canvas and straight up, and we're going to use canvas rotation to get the right angle. Think of it as if you're drawing on paper and rotates the paper before you start drawing. Rotation is part of the context state, so after rotating the canvas and drawing the hands, we're going to use context.restore() to restore canvas rotation back to it's previous state, i.e. no rotation. Rotate the canvas 180 degrees for the second hand, and then restore the context back to no rotation. If you think of animations as frames in a movie, each frame is a complete redraw of the canvas. So, in the clock example, each and every second, we need to do all the steps from drawing the background image to drawing the second hand. Now, let's continue working on the code for our clock. The context object has a drawImage() method which we are going to use to place the clock face image on the canvas. To draw an image at point 0,0 with a width of 400 and height of 400. The first argument to the drawImage method is a reference to an Image object. The src of this image is the clock face image you downloaded at the start of this tutorial. Now we can use "clockImage" as first argument to the context.drawImage method. But before we can do that, we should make sure that the image has been loaded from the server. We do this by adding an "onload" event to the image, and use a variable called "clockImageLoaded" which will be set to true once the image is loaded. Now, we will add a test inside clockApp which makes sure that our clock application doesn't start until the background image is loaded. What this code does is to check if clockImageLoaded is set to true. If it's not, i.e. the clock background image is not yet loaded from the server, it will wait 0,1 seconds before calling the clockApp function again. Now, let's add the code we need in the addBackground image function. We mentioned earlier that we want to rotate the canvas when we draw the hour-, minute- and second hands on to the canvas. The center point of rotation is 0x0. Think of it as if you press a finger down on the paper and rotate the paper around the point where your finger is. For our Clock application, we don't want to rotate the clock around the top left corner. We want to rotate it around the center point, i.e. canvas.width/2, canvas.height/2 or 200,200. Since 0,0 is at the center of the canvas, -200,-200 is at the top left corner. Now, let's start with the drawSecondHand function. It will give us a value between 0 and 59. We accomplish this by creating a closed path. This path consists of a couple of lines which starts and ends at the same point. Since we want a similar shape for the minute- and hour hand, let's move the shape code into a separate function and add the size as an input parameter(i.e. the -150 value). This is useful since we want the minute- and hour hand to have a different size than the second hand. We call drawHand from the drawSecondHand function and send 150 as size argument. Now, the second hand is rotated correctly according to time. But it's not updated every second. Let's take care of that. We can do this by calling the createClock function every second. There are two ways of doing this. We can use the setInteval() function or the setTimeout() function. Which method to use is optional. If you update your page now, you will see that the second hand is moving. Now, let's move on to the minute hand. We follow almost the same procedure as with the second hand. We extract minutes from the "theDate" object by calling the getMinutes() function. So when the time is 15:51:30, the minute hand should be positioned right between minute 51 and minute 52.
size, which we set to 130 instead of 150. If you refresh your page now, you will see that we have a black minute hand and a red second hand. I want to make the -4 on line 3, and 4 on line 6 dynamic, since that's the value which controls the thickness ot the hand. The minute hand on the canvas will now look thicker than the second hand. Let us complete our clock by adding code to our drawHourHand() function. We set hours to theDate.getHours() + theDate.getMinutes()/60. So when the time is 11:59, the hour hand will be positioned close to 12. Now, let's figure out how much we need to rotate the canvas. Here it's easy to go wrong. Hours will have a value between 0 and 24, but in 24 hours the hour hand will have completed two round around the clock. So when the time is 3am (3:00), we want to rotate the canvas 90 degrees, and when the time is 3pm or 15:00, we also want to rotate the canvas 90 degrees. There is 360 degrees in a complete circle, and twelve hours in a complete circle. So the time 3:00 gives us 3 * 360 /12 = 90, and 15:00 gives us 15 * 360 /12 = 450, but after using the modulus operator % on 360, it gives us 90. (360+90 = 450 and 0+90 = 90). You may also drop the % operator, since it's perfectly ok to rotate the canvas 450 degrees. Right above the center of the canvas, we want to write "Canvas" (or a name of your choice) as brand name for our clock. First, let's make sure that the writeBrandName() function is called from createClock(). We want to call it right after we have added the background image, since we want "Canvas" to be written on top of the background, but appear underneath the hands of the clock. The properties and methods we are going to use to write the text is context.font, context.measureText() and context.strokeText(). There's a lot of other options available, which you can take a look at by following the references listed at the end of this tutorial. First let's specify a font with context.font. context.font let's you specify a lot of font properties such as size, which font to use, font weight(example: bold), font style(example: italic) etc. We are going to write the brand name in a 25pt size Helvetica font (It's important to choose a font which is available on most computers). We want the brand name to be center aligned horizontally. There are several ways to do this, but the safest way is to measure the size of the text first, and the subtract half it's width from the x coordinate before we draw the text on to the canvas. context.measureText() will return width and height of text according to the current font properties. So it's important that we specify which font to use(context.font=...) before we call measureText. 0 - width of text / 2.
context.strokeText() outlines the text. If you want it filled, you can use context.fillText(). The color used will be the current values of strokeStyle and fillStyle. Step 5: Add shadow effects. Let's finish our tutorial by adding some shadow effects. We want to add a small shadow effect to the hour hand since it's closest to the clock, a little more shadow to the minute hand and most shadow the second hand since it's closest to us. context.shadowOffsetX : How far the shadow should extend from the object in the X direction. context.shadowOffsetY : How far the shadow should extend from the object in the Y direction. Add transparency to the second hand. This can be done by changing the context.globalAlpha property to a value between 0 (full transparency) and 1 (full opacity). Example: add context.globalAlpha = 0.8; right below the line context.fillStyle = 'red'. You may also want to try have a combination of fill and stroke for the hands. Simply add context.stroke() at the bottom of the drawHand() function and set context.strokeStyle to a color inside the drawSecondHand(), drawMinuteHand() and drawHour() functions. Please, let me know what you think about this tutorial, and what you would like to see next. Draw a circle around the watch. Chris Bolson at 07:55PM, 2011/11/01. Chris Bolson at 08:57PM, 2011/11/01. Protus Goodluck Fortunatus at 12:18PM, 2011/11/10. 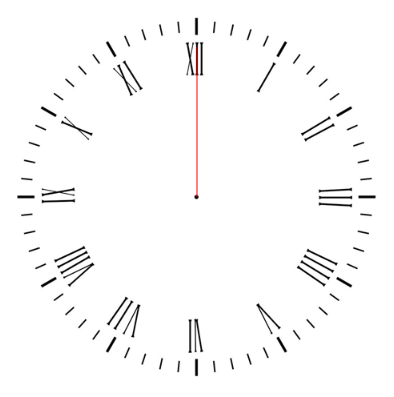 Great tutorial - made it easy for a part time code cutter like me to follow, thanks.I made a plugin for FlatPress using your code, and I gave you a link back to this page.http://flatpress.georgi.co.uk/2011/11/24/canvas-clock-plugin/You can also see it on the FlatPress Wiki plugins page, with a few pictures of some other clock designs I made:http://wiki.flatpress.org/res:plugins#canvas_clockI just have one problem: when I view the clock in FireFox (yours as well as my plugin version) I get a TWO seconds hands (but one shadow). The "ghost" seconds hand is one second behind the first one and appears when the real seconds hand appears when you first load the page, i.e. it all looks fine but when that first second ticks over the outline (no fill colour) of the seconds hand remains and proceeds to follow the coloured in version around the clock.No-one's reported this to me - I've just noticed it myself (Firefox isn't my main browser - it looks fine in Opera & Chrome).I just did a screen shot of it and posted it here so you can see what I mean:http://flatpress.georgi.co.uk/canvasclockff3/Any ideas what's going on? Paul Tate at 07:15PM, 2011/12/26. Paul Tate at 07:32PM, 2011/12/26. I just tested it on Version 8 on another computer and it looks fine. Not being a FF user all I can say is "Wow! How did they get from versions 3/4 right up to those high numbers?". Pretty confusing to me - they seem to have a few different versions running concurrently from what I can tell from the list at Wikipedia. Paul Tate at 09:22PM, 2011/12/26. Great script. I was wondering, is there a way to call the time from a server so I can display multiple clocks from different time zones? Thank you for a great canvas animation tutorial! Louis Opperman at 01:57PM, 2012/03/13. I don't like one thing in this tutorials and that is drawing object in each second. Is there no other options of rotating object by drawing it only one time? Is this a good OOps concept? I think repetition of same object drawing will effect on the system memory. Sorry if I am wrong. I am new to java-script platform. Arindam Mojumder at 01:15PM, 2012/06/05. Arindam,That's a good question since the standard behaviour of DHTML is that you can move objects. An alternative to Canvas is SVG(Scalable Vector Graphic) which let's manipulate objects after they have been rendered.However, when working with canvas, you have to think more in terms of a movie/film where you show a number of frames per second. With the clock, I only need to show one frame per second, so I'm re-painting the screen every second. Canvas does not support moving objects once they have been painted to the screen. Excellent tutorial. Its so good I'm going to make two "trivial" criticisms. I'm an embedded programmer where waste is always a bad idea. I'm serious, it is a great canvas lesson so I'm paying it the compliment of criticising what stops it being perfect!Instead of drawing the image on the canvas I would have had the image as a static HTML element, and only used the canvas for drawing the hands. This would have reduced the "work" done each second.Polling to see if the image is loaded is clumsy. The image.onload event should cause the first rendering, and start the 1 second timer. I actually came here to solve a problem that I don't think is stated clearly here. If you want to resize the canvas you must change both the canvas.width/height to an integer, and canvas.style.width/height to integer+"px". Francis Cagney at 10:37AM, 2012/07/02. Hi,Very useful and easy to follow. Thank you!It would be interesting to add sound effect when the second hand is moving.Regards! I love it...And I firmly believe that we must appreciate how much effort he has done to achieve it. Above all he is teaching and allowing everyone else to learn from it....He did a wonderful job... So guys always appreciate what is done than to criticize what is not done...Enjoy life guys...Regardless of your opinions. md khurshid at 07:08AM, 2013/07/15. Hey, this tutorial is awesome. However, my clock is not showing on my browser. Any suggestions on what could it be? Ernesto Chapa at 07:29PM, 2013/07/25. Amit Kumar at 06:32AM, 2014/07/24. <a href="#comment1348">Jazz wrote:</a>Great script. I was wondering, is there a way to call the time from a server so I can display multiple clocks from different time zones? I'm also interested in this answer! Does anybody how to do it?Great tutorial btw.Thanks ! I replaced 'context.lineTo(0, size * -1);' in the drawHand function with the lines context.lineTo(-1, size * -1); context.lineTo(1, size * -1);It improves the visibility of the second hand on a display 360 pixels wide.